Harmonic distortion problems include equipment overheating, motor failures, capacitor failure and inaccurate power metering. 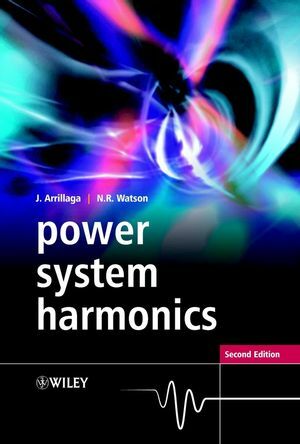 The topic of power system harmonics was covered for the first time 20 years ago and the first edition has become a standard reference work in this area. Unprecedented developments in power electronic devices and their integration at all levels in the power system require a new look at the causes and effects of these problems, and the state of hardware and software available for harmonic assessment. Following the successful first edition, this second edition of Power System Harmonics maintains the practical approach to the subject and discusses the impact of advanced power electronic technology on instrumentation, simulation, standards and active harmonic elimination techniques. A new chapter on modern digital instrumentation techniques. Added sections on active filters and modern distorting devices such as FACTS devices, multilevel conversion, current source, voltage source inverters and turn-OFF-related power electronic devices. References to international standards for harmonics and inter-harmonics. Numerical examples of technique application. Offering a comprehensive understanding of power systems, this book is an asset to power engineers involved in the planning, design and operation of power system generation, transmission and distribution. Researchers and postgraduate students in the field will also benefit from this useful reference. Jos Arrillaga is an experienced author, now an Emeritus Professor from the Department of Electrical and Computer Engineering at the University of Canterbury, New Zealand. He has written 10 books, including five for Wiley on the topic of electrical power systems, such as Power System Harmonics, Second Edition, Computer Modelling of Electrical Power Systems, Second Edition and High Voltage Direct Current Transmission. He has also written over 350 journal and conference papers. During the course of his career he has supervised around 50 PhD and 60 MSc/ME theses, most of them on the subject of high voltage direct current transmission, and he has also participated and convened several working groups. In 1997 he was awarded the Uno Lamm medal for outstanding contributions to HVDC transmission and he was in the New Years Honours list as a member of the New Zealand order of Merit. Neville Watson is a professor with the Department of Electrical and Computer Engineering at the University of Canterbury. His research interests include power systems, power flow and harmonics. He is a senior member of IEEE and member of Institution of Professional Engineers New Zealand. 1. Subject Definition and Objectives. 4. Effects of Harmonic Distortion. 7. Computation of Harmonic Flows.